Why is that scene in The Notebook where Noah rows Allie through a lake full of geese and swans so captivating to us? Besides their outward beauty, swans are the archetypal image for romance, for purity, grace, love, and devotion. Because this regal creature also symbolizes spiritual transcendency, we chose the swan for the cover of my book, The Logos of Soul, A Novel on the Light and Sound. This novel is about the teachings of Jesus in the context of the ancient mystic system known today as the Light and Sound. Now, the swan was not necessarily a symbol embraced by Christianity, and that could be because the Jews viewed them to be unclean. But the Bible does hold some spiritual symbolism for birds. The traditional Jewish bible stories that became the Old Testament liken the release of the human spirit in death to a bird that has escaped the hunter’s snare. When John baptized Jesus, the Word of God descended from heaven like a dove upon his head. Greek tradition, which also went into the development of Christianity along with the Jewish, was a bit more graphic and specific in seeing the swan as a creature that could freely cross the line between mortality and immortality. In mythology, Helen of Troy was conceived in a union between Leda, the Queen of Sparta, and Zeus, who had taken on the form of a swan. To me, the story shows the human yearning to merge with divinity, and perhaps because swans supposedly mate for life, the myth also conveys an element of devotion. Other cultures also viewed swans as living on the precipice between life and death. In Norse mythology, two swans drink from a sacred well in Asgard, the home of the gods. The water of this well is so pure and holy that all things that touch it turn white. Conversely, in Finnish mythology, a swan swims a river located in the underworld realm of the dead, and whoever kills a swan will perish as well. The Hindu revere swans on an even deeper spiritual level. The Sanskrit word for swan is hamsa or hansa, and those who have attained great spiritual heights are sometimes called Paramahamsa, the Great Swan, because of their grace and ability to travel the higher planes of consciousness. In the ancient Vedic texts, swans are said to summer on Lake Mansarovar, or the lake of the mind. The lake, mythologically created in the mind of Lord Brahma, is a real-world place of pilgrimage as the desolate mountaintop source for four of Asia’s greatest rivers. A person who drinks from the ripple-less lake is said to have their mind purified and will go to the abode of Lord Shiva after death. In the Light and Sound Teachings, which predates Hinduism as well as Judaism and Christianity, the Lake of Mansarovar represents the juncture on the spiritual path where the soul, represented by the swan, is purified and merges with the Radiant Form of one’s chosen Master. This august event happens internally within the higher realms of one’s consciousness. Just as the swan’s feathers stay dry in water, the soul at this point is no longer attached to its own lower creations and floats above the mind. Within the teachings, this is known as self-realization. Although swans do not figure in Christianity, water does. Jesus referred to the Living Water as the sustaining, purifying Word of God, which was translated into Logos in Greek. To the Samarian woman at the well, Jesus said, “Whoever shall drink from the well I give him shall never thirst. The water I give him shall be in him a well of water springing up into everlasting life.” To the Greeks, however, the Word, which they translated into Logos, had a different meaning. Rather than be the Word of God, Logos referred to the harmonious, overriding power of the universe. In the Light and Sound Teachings, the Word is considered to be the Audible Life Stream or Sound Current, the Shabda Dhun in Sanskrit. The Shabda not only encompasses both the Hebrew and Greek definitions, but It also provides the means of returning the soul to the Source, which bubbles up within oneself like an everlasting spring. 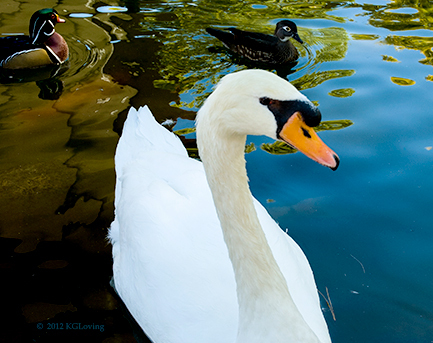 I love photographing swans, but my view of their earthly spirit is more grounded in reality. 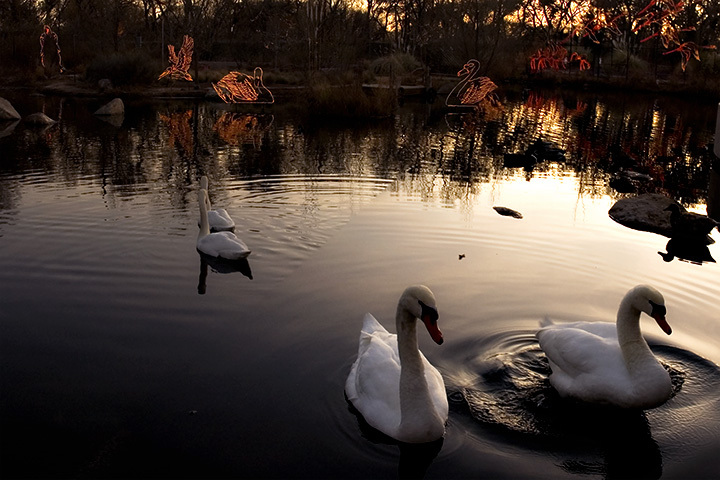 The particular swan on the cover of The Logos of Soul was a fellow who swam among ducks in a pond at the Albuquerque zoo. I visited him often. Mate-less, he was a fierce creature, completely attached to his territory. He would speedboat toward the wharf at the very sound of a quarter dropping into a bird food machine, raising his wings heavenward as he pierced the water to scoop up the pellets before the ducks got to them. Swans look serene when they effortlessly flow among the eddies with their mates, wings folded inwardly. However, when we see them in that classic pose, wings outstretched, they are in their least serene state, instinctively defending their territory. But that doesn’t make them any less spiritual. Swans may look like angels, but they are determined and focused, and to me these traits well serve the soul in its journey beyond the lake of the mind. For more information on The Logos of Soul, A Novel on the Light and Sound Teachings, please go to SoulJourn Books.